'Peace of Mind' means you will have everything you need and then some in this 5 bedroom, 4 bath beautifully decorated and immaculately kept home with a view. The home is bright, open and cheerful with ocean views from the interior 2nd floor wrap around landing and the upstairs oversized deck and covered porch. There is plenty of outdoor furniture to dine and relax. The master has an ensuite bath with whirlpool and private access to the covered porch and deck. Washer/dryer conveniently located on 2nd floor open landing in laundry closet. There are 6 televisions, 3 DVDs, stereo/CD for media entertainment, wireless internet and phone with domestic long distance included. Gas log fireplace in living area. The kitchen is well-stocked and there is dining to accommodate 8 at the indoor table, 4 stools at eat-in kitchen counter, and outdoor dining to accommodate 4 on adjacent covered porch. Outdoors there is a hammock, picnic table, hot/cold outside shower and gas grill. Other amenities include renter's closet with beach cart, chairs, and sand toys for the kids, port-a-crib, gated deck. 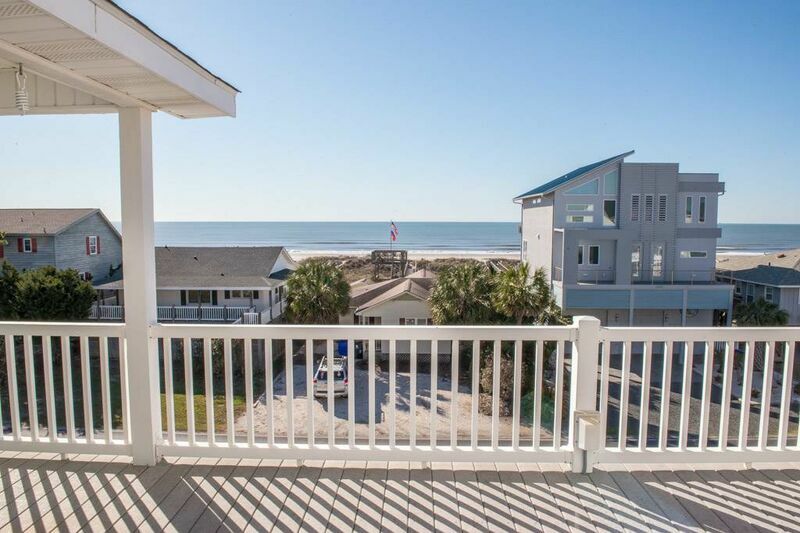 Beach access is nearby at Goldsboro. Non smoking. Sleeps 14. Bedding: First floor: 2 Twins, Queen. Second floor: Double Bunk with Double trundle, Queen, King in master. This is probably one of the best houses we've stayed at. It has been kept so nice & clean & the space is wonderful!!! We will be staying again!!! "Peace of Mind"is the perfect name for this wonderful vacation home. It is ideal for our entire family, which includes grandchildren ages 6-21. The home is beautifully furnished and decorated, the kitchen fully equipped, and the bedrooms very comfortable. The owners use top-quality appliances and keep the home clean and well cared for. The central living area is spacious and comfortable, and accommodates quite a few family members at one time. There are plenty of "get-away" spots on the two porch levels, and all of our guys love the private outside shower. An added feature we enjoy is the nice-size gas grill. Having rented "Peace of Mind" each of at least the last 10 years tells how much we love this beautiful vacation home and look forward to our return. It is always hard to leave! We found the home to be an excellent choice for us. It was decorated with a beach theme throughout and furnished very elegantly for a rental. The kitchen was extremely well-furnished with small appliances of every kind. The amount of beach equipment was unreal for a rental unit; therefore, we left most of our own equipment in our vehicles during our stay. With only 1-story homes on the ocean front directly across from us; the house allowed us great views of the ocean even from the first level deck. The only complaint we had was that there was not a door on the screened-in porch (which inadvertently made it open to insects). But, there was such a good breeze most evenings so that insects were not really a problem. The 2nd level deck/balcony was great for sunbathing as well as watching the stars during the evening. Overall, the house had abundant seating inside/outside which allowed each of us to entertain ourselves whether by watching TV, playing the stereo, playing cards, sitting around chatting, or just watching beach traffic.